Connor McDonough-Flynn (@ConMcFlynn) #TakingTheStage at Takin The Mic in the Irish Writers’ Centre (@IrishWritersCtr) on the 29th of May 2015. Doors 18:30. Come early, stay late, all genres welcome. Welcoming poets, prose writers, songwriters and musicians, comedians and anyone else who wants to have a go at our monthly open mic night. This is your time to shine! Guest MC is Sarah Maria Griffin, author of Not Lost: A Story of Leaving Home. – Be guaranteed a performance slot by booking a spot via Eventbrite. NB: those looking to just attend and not perform should NOTbook a ticket. Tickets are for performers only. This will be the last open mic night before our summer break so come out and celebrate it in droves! Connor McDonough-Flynn (@ConMcFlynn) #TakingTheStage at Takin The Mic in the Irish Writers’ Centre (@IrishWritersCtr) on the 24th of April 2015. Doors 18:30. Come early, stay late, all genres welcome. Join us for this timely special edition open mic where we’re teaming up with neighbouring LGBT poetry night Well Versed (Outhouse). We’re pooling together our wordy talents and communities for a quality evening, showcasing some of the city’s finest new voices. Prose, flash fiction, stand-up, music – all welcome! Special guests to be announced soon so stay tuned! Sign up via Eventbrite to book your performance slot of max 5 minutes. Places are limited as this event is semi-curated. Connor McDonough-Flynn (@ConMcFlynn) #TakingTheStage at Takin The Mic in the Irish Writers’ Centre (@IrishWritersCtr) on the 27th of March 2015. Doors 18:30. Come early, stay late, all genres welcome. Welcoming poets, prose writers, songwriters and musicians, comedians and anyone else who wants to have a go at our monthly open mic night. We’re thrilled to have writer and stand-up comedian Colm O’Regan as guest MC on the evening. Connor McDonough-Flynn (@ConMcFlynn) #TakingTheStage at the Culture Night ‘Takin The Mic’ in the Irish Writers’ Centre (@IrishWritersCtr) on the 19th of September 2014. Doors 18:30. Come early, stay late, all genres welcome. 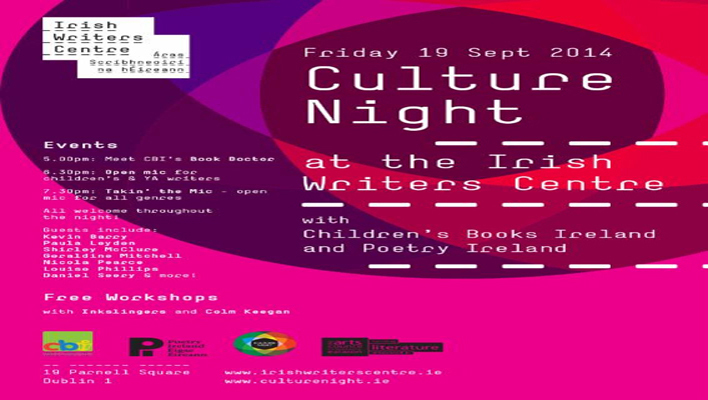 The Irish Writers Centre, in collaboration with Children’s Books Ireland and Poetry Ireland, promises a fun evening for all ages and we’re delighted to now reveal some of our special guests … Read on! 5-7pm: Meet the Children’s Books Ireland expert Book Doctor with book recommendations and activities for young readers. 6.30-7.30pm: Open mic for writers of children’s literature and young adult fiction. Five minute slots with special guests also. 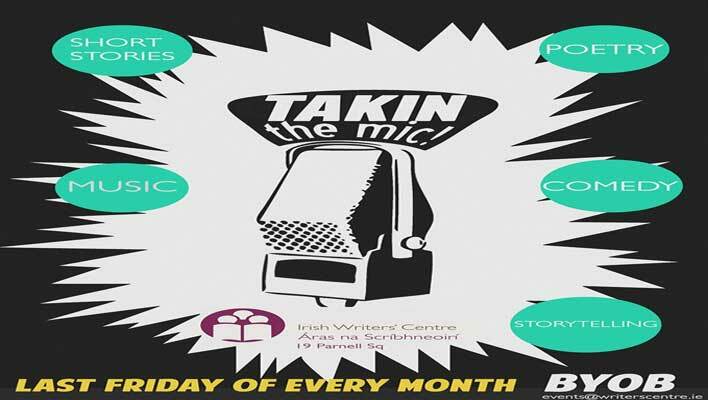 7.30-10pm: The Irish Writers Centre and Poetry Ireland present a once-off Takin the Mic open mic event, welcoming writers and performers of all genres. Dave Lordan will be MCing the evening and there will be guest performances throughout the event! And if you don’t have anything prepared but want to take part, we’ll have lots of pieces for you to choose from in our lucky dip. 6.30-8pm: Creative writing workshop with the Inkslingers creative writing group. 6.30-7.15pm: Spoken word workshop with Colm Keegan (Lingo Festival). Take the mic with confidence! Places are on a first come, first served basis. Is í An Roinn Ealaíon, Oidhreachta agus Gaeltachta i gcomhar le Comhairle Cathrach Bhaile Átha Cliath agus Iontaobhas Cultúrtha Bharra an Teampaill a d’eagraigh Oíche Chultúir duit. Connor McDonough-Flynn (@ConMcFlynn) #TakingTheStage at Takin The Mic at the Irish Writers Centre (@IrishWritersCtr) on the 30th of May 2014. Doors 19:00. BYOB. Calling all writers, poets, spoken-word artists, musicians and songwriters: come join us for our open mic night on Friday 30th of May. Guest MC on the night is Colm Keegan. Admission is free and doors are at 7.00 pm. Arrive a few minutes ahead of time if you want to book your slot or you can let us know here. Tell your friends and get RSVP-ing! 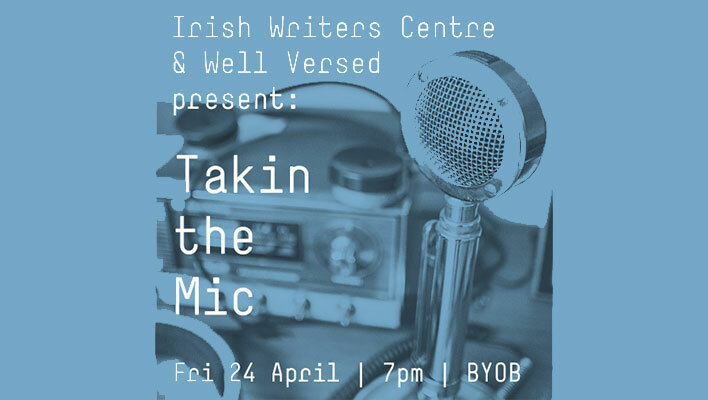 *For non writers dropping by the Irish Writers Centre for a chat and to listen is an engaging and enjoyable to hang out and hear very different styles of writing and poetry in various stages of completion. *It’s fun. Open mics are social events. It is important to meet fellow writers and get out of your study! *The purpose of art is for it to express itself. Reading your work out is a powerful statement in and of itself. *It helps the writing process: Reading your work out to your peers is a fast powerful editing tool for your work. It shows what works and what needs work. Event times: 7 pm – 9 pm: Every last Friday of the month. There will be approx. 3 breaks during the open mic. BYOB (bring your own bottle) event. Tea & coffee available at reception. BYOB policy. Avoid bring (or at least spilling) red wine. Connor McDonough-Flynn (@ConMcFlynn) #TakingTheStage at Takin The Mic at the Irish Writers Centre (@IrishWritersCtr) on the 25th of April 2014. Doors 19:00. BYOB. Calling all writers, poets, spoken-word artists, musicians and songwriters: come join us for our open mic night on Friday 25 April. Guest MC on the night is Dimitra Xidous, whose debut collection of poetry Keeping Bees has just been released.